Yes, my honey buns likes to lay down all the time when he’s working from home. 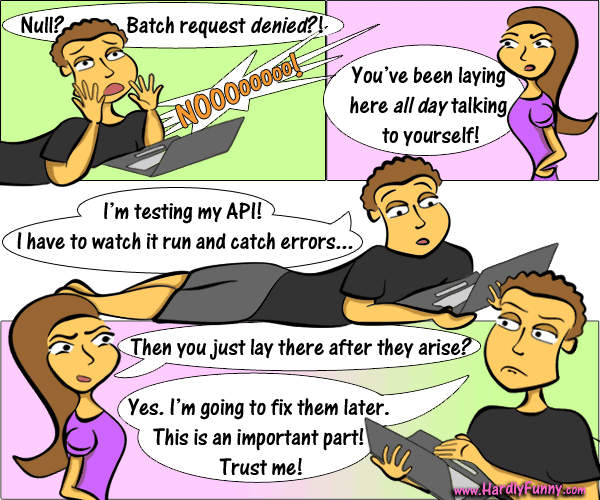 I found out he’s actually “watching the API run” and monitoring errors. Then he looks through the data later to troubleshoot! What a long process. I can tell he likes laying down almost as much as coding APIs. Randall’s newest evil plot: a hackathon that will probably attract black hats. Eeek! 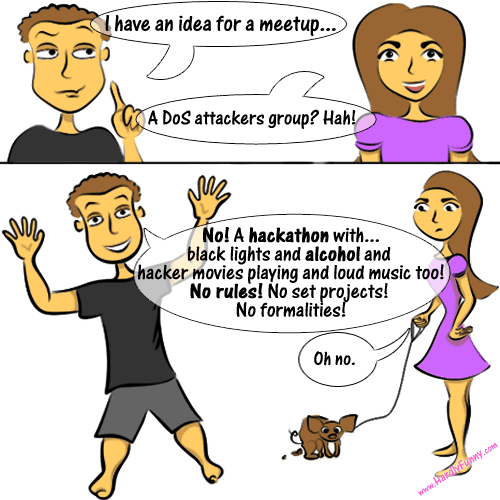 On the safer side, we are considering starting a coding group for the East Bay on Meetups.com. We attended our first robotics competition! 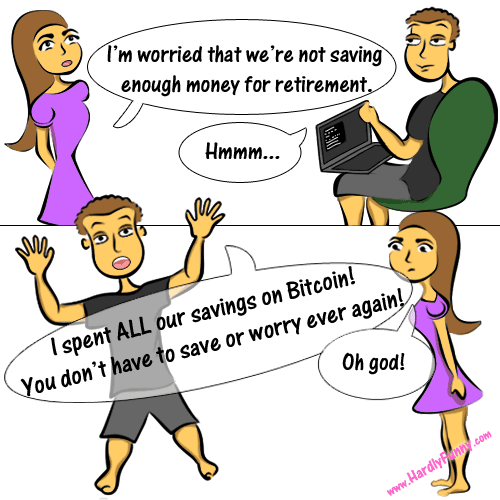 That’s what we do for fun now….yeah. It was a regional F.I.R.S.T. Robotics Competition at San Jose State. My geeky husband, who pirates too many violent shows, kept asking when the robots were going to destroy each other. Thankfully, they never did and instead displayed their many impressive and uber exciting skills. All the robots were built by teenagers and were sponsored by some pretty big names including NASA and Google! 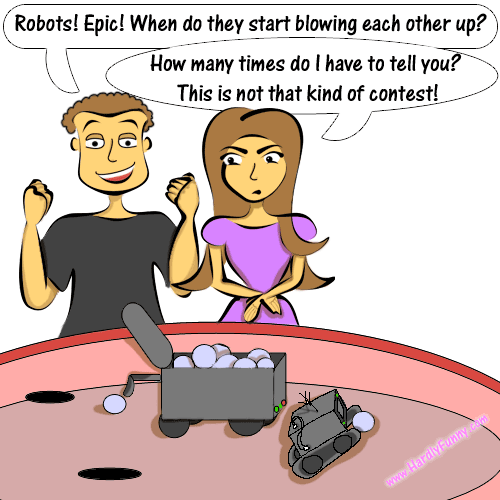 We’ve added robotics to our list of things to do this year as a couple. You should definitely check out some video of the competition here: Time Magazine covers FIRST. It takes a lot to anger Randall, but he never fails to yell this after talking to Comcast. 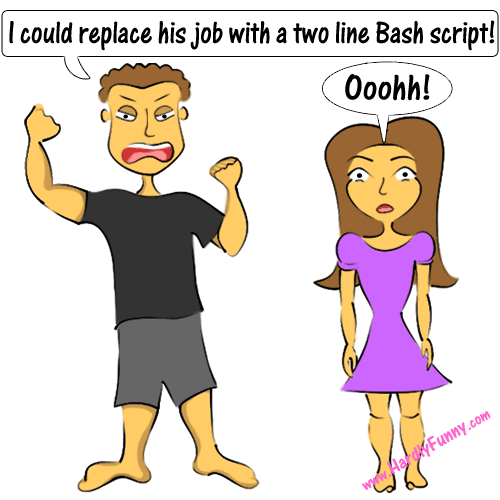 I just learned what Bash is the other day even though I’ve been using it for almost a year. I initially thought it was a language! Wow. Even a simple shell script can replace a job. Happy Anniversary Baby! Congrats on three years of marriage. It doesn’t feel like forever yet, so that’s a good sign! Today is my birthday(and Easter)! I just remembered it’s my twin sister’s birthday too, so happy birthday Allison! 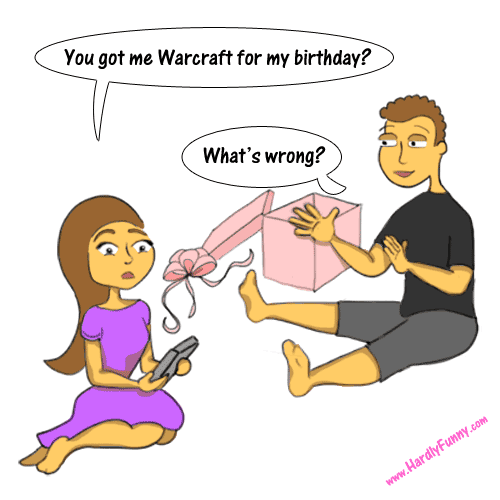 Anyway, one year Randall gave me Warcraft ( in a little software box-remember those?) as a present. I was livid. First of all, I hadn’t played the game in years! Secondly, it cost money to play! That turned into a fight… especially when I found out he threw out the receipt. Oh well, it was still nice of him.